The acronym GH refers to Great Height. In effect, owing to its properties and place in the treatment chain, in good conditions, this filter can treat with large heights of material (up to 2 m). The Carbazur GH can be equipped with stainless steel channels for dirty washing water return. Used at filtration rates of between 7 and 20 m · h–1, these filters are designed exactly the same as the Aquazur V filters with the exception of the wash and feed system. The Carbazur GH is used for second stage filtration. The GAC has an effective size of approximately and 0.7 mm for the Carbazur GH. deep layer of water over the filter bed, equal to at least 1 m and, in most cases, 1.20 m.
a GAC depth usually between 1.2 and 2 m.
one or more valves or air plug valves totally cutting off the supply of water to be filtered during the drainage and air scour phases. 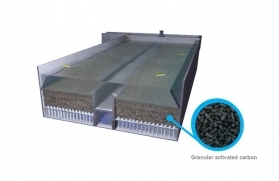 a high wash water return flow rate, depending on the filter bed material, thus constantly maintaining bed expansion during the wash phase. 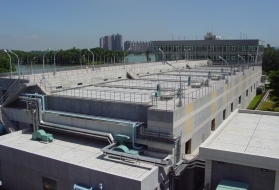 water only rinse, at high speed, designed to expand the filter bed, to flush out the impurities dispersed throughout its depth using scour air, and to regrade the materials. Depending on its width and on the rinsing velocity, the Carbazur GH filter must be equipped with several transverse troughs to prevent the GAC from being drawn away into the drains during the water only rinse.